The latest release of documents related to the mass shooting on Oct. 1 contain a mixture of reports by police officers and witness statements. One of the reports contained in the release on Wednesday appears to be an interview with country singer Jason Aldean, who was performing when Stephen Paddock opened fire on music lovers at the Route 91 Harvest Festival. According to the statement, the person making the statement instructed officers to take himself, his bodyguard and pregnant wife to the airport. He then told the officer that he was on stage playing when he heard the first few pops. He said he was confused like everyone was and looked around, but didn't see anything out of the ordinary. The next large barrage of fire he said was so loud to him that it sounded as if someone was right next to the stage firing shots. The person making the statement then said he could see people in the audience dropping to the ground in "waves." Someone backstage yelled out that it was gunfire and for him to get down. That's when he ran off the stage and went to protect his pregnant wife who was inside the tour bus that protected the perimeter until he was evacuated. The documents included what appears to be a written statement from Aldean. "I was onstage singing and thought I heard fireworks. I turned to look at my monitor guy and saw my personal security guard running toward me and telling me to evacuate the stage. At that point, we layed (sic) on the stage and hid until we could get on my bus. We then stayed in the back of the bus for a few hours until police escorted us away." Another report appeared to be an interview with Dee Jay Silver, who had performed at the festival around 9 p.m. ahead of Aldean. After the shooting began, he was hiding in a tour bus. Silver then received a text asking what floor his 1-year-old son was on. The baby was sleeping down the hall on the 32nd floor -- the floor where shooter Stephen Paddock was located. That's when Silver found out the floor had been evacuated. Silver was taken to multiple places before he ended up at the Thomas & Mack. He eventually received a text that his son was at Town Square. After he was reunited with him Silver told police, "I just held him and held him and held him." Police also asked Silver if he had noticed any suspicious, staying on the same floor as the shooter. Silver did not recall seeing Paddock or speaking to him. But he also didn't see housekeeping during that time. Silver was moved to Delano after the shooting. A bike officer with Mandalay Bay described how he was headed towards the festival grounds when he heard that a Mandalay Bay officer was hit and decided to turn around. He commandeered an elevator, picked up an engineer, and headed to the 32nd floor. When he got there, he heard automatic gunfire coming from the end of the hall. According to the bike officer, that is when Jesus Campos came running towards him when the shooting paused. The bike officer says he inspected the wound and decided it didn't look very severe. Everything was kind of a blur after that but the bike officer said he helped police officers clear the rooms. One police officer who was at the scene describes how he and other police officers took cover behind a police car during the shooting. The officer says that multiple rounds hit the car and the rear window was shot out. One of the officers began yelling that he was hit and said he could not move his arm. Another officer grabbed the wounded officer and they left to seek medical attention. According to statement by several police officers, there was a lot of commotion and confusion the night of the shooting at several properties located near Mandalay Bay. Calls were received from Circus Circus, Tropicana, Bellagio, New York-New York and the Bellagio hotel-casino. In each case, police officers were unable to find another shooter. However, they did discover that the possible shooter at the Bellagio was actually the vice president of security. It appears that the VP decided to put on a tactical vest and arm himself and protect Bellagio if necessary. Many reports from officers describe how they were off duty at the time of the shooting but "self dispatched" when they began to hear what was happening. Several officers headed towards the Route 91 festival grounds while others headed to hospitals where victims were being assisted or even took it upon themselves to assist with traffic control. Another police officer described what he was thinking as he was riding in an elevator at Mandalay Bay. "As we rode uop the elevator I distinctly remember saying a prayer in my head for all of us in the elevator and the ones still dealing with the shots coming at them." That same officer also said, "The sound of the shots were so very loud and reverberated through the hall like thunder around and above us." In addition, one statement describes how several off-duty officers from California and North Las Vegas who were at the scene began helping numerous victims. In addition, there were employees of "unknown federal agencies" and an unknown Las Vegas police cadet who also jumped in to help. One of the odder incidents contained in the reports included one about a woman who wanted to do something nice fo police officers that night. 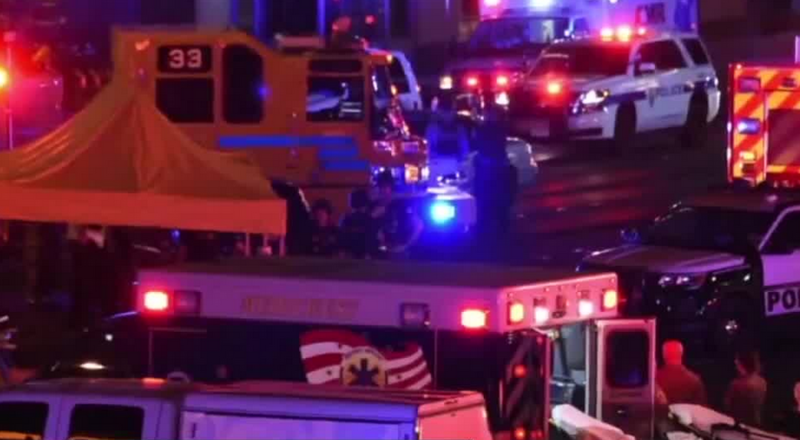 A group of police officers were at the Stratosphere hotel-casino. A woman in a black VW Jetta pulled into the valet area and threw a box wrapped in a bag in front of an officer. She then began to drive away. One of the officers ran towards the car and pointed his rifle at the woman, causing her to stop. They ordered the woman, who had a smile on her face, out of her car. A K9 was called in to examine the box. The contents were determined to be a box of doughnuts. The woman stated that she felt bad about the incident and just wanted to do something nice for the officers. The police officer who wrote about the incident said he thanked her for her kind gesture and told her not to do that to any more units because she could have been shot. The reporting officer praised his fellow officers in the statement for showing restraint, saying they used sound tactics and verbal commands to de-escalate what could have resulted in a catastrophic use of force on a citizen who chose the wrong time and place to do something kinds. Another officer much closer to the scene described another act of kindness by someone who had heard about the mass shooting. The officer wrote that he saw a "crappy old Nissan" pull into a parking lot around 4 a.m. Oct. 2. A woman exited the driver's side and handed the officer two blankets that she had just purchased from a local Walmart. She told the officer she saw the news reports and knew people were cold. The police officer said "judging by her manner of dress coupled with the ill repair of her vehicle I was able to surmise that she had just spent her last couple of dollars buying two blankets. Here was an individual with nothing to spare sparing everything she had. After an endless night it reminded me there is still more good than bad in this world." The release of documents on Wednesday also contained a statement obtained from mass shooter Stephen Paddock's brother. The brother wanted to make sure Paddock's assets were protected because he wanted to make sure there was money for the victims. He stated that if he could just make sure his brother’s assets will be safe, he will go to the media and tell them his intentions of creating a trust and donating any remaining assets to the victims. He also speculated about what was on the piece of paper that was found in room at Mandalay Bay where Paddock fired upon his victims. He said he did not think it was a suicide note and probably contained a taunt. The released documents also contained statements from other people who believed they had interacted with Paddock before the shooting. One employee that helped Paddock with his bags said that he wanted to go up to his room on the "back elevators." The employee also said that the request was not uncommon and said that Paddock had "regular" bags. Also said Paddock's demeanor was quite and polite. The employee said that some guests are loud but Paddock was "pretty mellow." Some statements also contained references that appear to be critical of local firefighters who also responded to the scene that night. One medic was described as being hesitant to drive to a man who was on the ground because he was worried about his safety entering a "hot zone." Another statement said that firefighters informed police officers that they had to leave the scene because it was time for a shift change. Plenty of civilians also stepped up on the night of 1 October to help those who were injured, according to several reports by police officers. Civilians helped with first aid at the scene and provided transportation to local hospitals.